This is one of the Black Tree Design figures that was on sale last month. I had actually added a set of Early-HYW figures as an afterthought as I had mainly wanted some Norman and Crusades figures for SAGA. As some of my order was initially out of stock it took over a month to get my order, and in the meantime my current interest had shifted to Lion Rampant. Here is one of the HYW figures painted up as the famous knight, Sir John Chandos. This cool looking rearing horse caught my attention, and compelled me to add him to the order. All of the BTD figures are very nicely sculpted with good details. They are on the larger side of 28mm, and would probably fit well with Front Rank HYW figures. Chandos' arms being fairly simple, this figure was painted up without much problems. In fact, I started on him this morning and just finished him. The other two mounted figures will also be painted up as famous English knights from the period. Sir John met his end in a gruesome and painful way after a minor skirmish action. Froissart detailed it in his chronicles. Finally managed to pick up a brush today - after several weeks of painting inactivity. This will be used in an Actium game as Cleopatra's command ship. It's a Valiant Ramming Speed 1/900th scale Deceres converted to be a 1/1200th scale Tessarakonteres; One of the largest of ships from Hellenistic times. As the rest of the ships for this game are 1/1200th scale, this ship will be suitably large and identifiable as Cleopatra's. Here it is next to a Langton Quinquereme. It is based upon this image of a Tessarakonteres. The towers midship and fore were made from Green Stuff; the tent in the rear is made from spare plastic sprue. The three other ships will be painted up next as command ships belonging to Antony. They are a Langton Deceres and Octeres, as well well as another Ramming Speed Deceres. 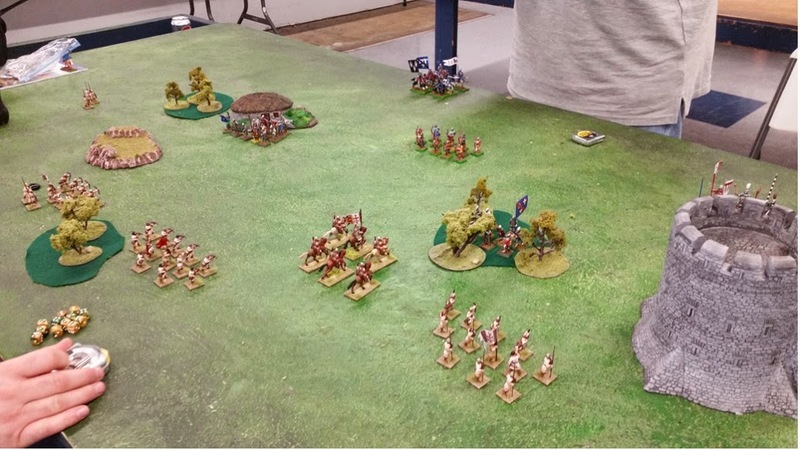 Several of us met at the Game Matrix in Tacoma today for some Lion Rampant games. It was the first time for most of us, but we all seemed to enjoy the rules even though we may have not gotten everything exactly right. For one thing, in the game I played we initially had not correctly done the Courage tests. We didn't count the casualties cumulatively when figuring out the tests - that is, we only subtracted casualties caused in each turn when working out the Courage test result. At first this seemed very harsh and made for units to be destroyed quite quickly, but it does seem correct for the overall flavor of fast-paced game. My buddy Adrian and I used the Bloodbath scenario as it is the most straight forward. I only got off a few pictures as I was referring to the rule book throughout the game to ensure we were on track. My Early-HRE foot serjeants receiving an attack by English MAA. The foot serjeants are good at defense - although in this case they'd have been even better off in Schiltron, but they had just moved out off the woods in their previous turn. 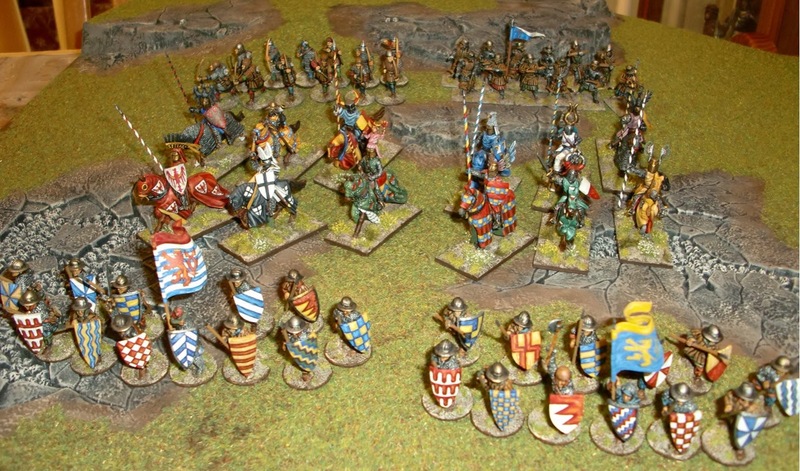 The same unit of HRE foot serjeants in the previous turn in cover from English archers. 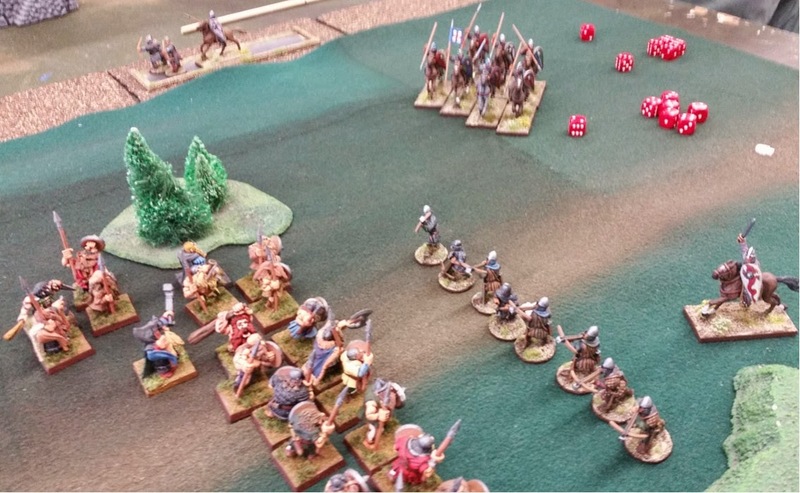 The HRE crossbowmen only got to take out a few of the English before they failed their Courage test after receiving casualties from English bow fire. 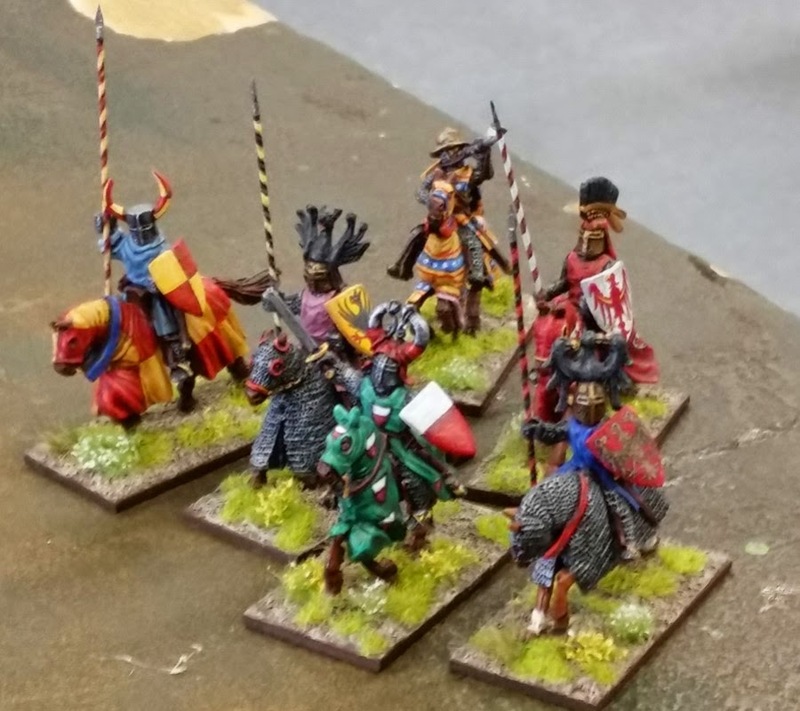 One of two HRE mounted MAA units - with the Archbishop of Cologne as the retinue leader. 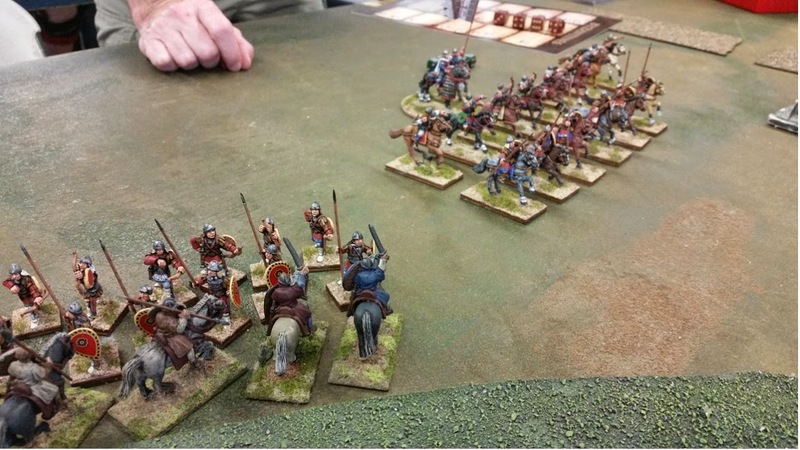 Both mounted MAA units failed multiple movement activations early in the game. After eventually passing their movement activation this unit put the English right to flight. 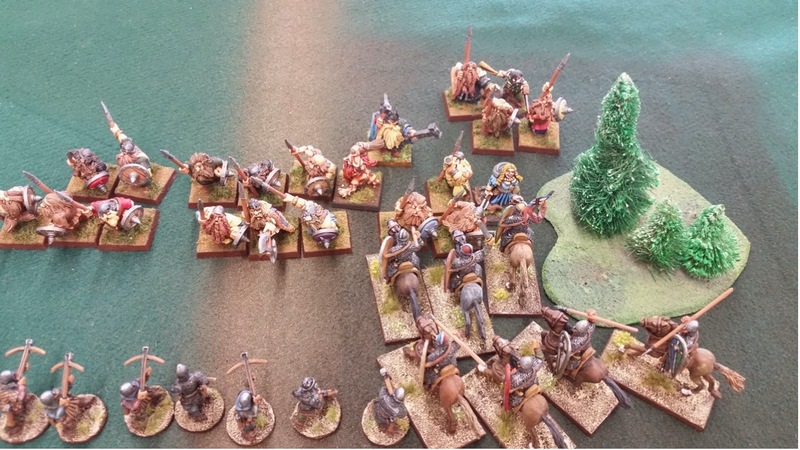 The mounted MAA unit on the HRE right eventually passed movement activation to move up and attack an English foot MAA unit. They did very well in their attack and practically destroyed the English foot MAA unit. However, due to consecutive bad Courage tests, enough HRE units left the table to give the English an edge for victory. Wes' knights taking fire from Scott's bidowers. For the most part I have no trouble with the rules as they are. 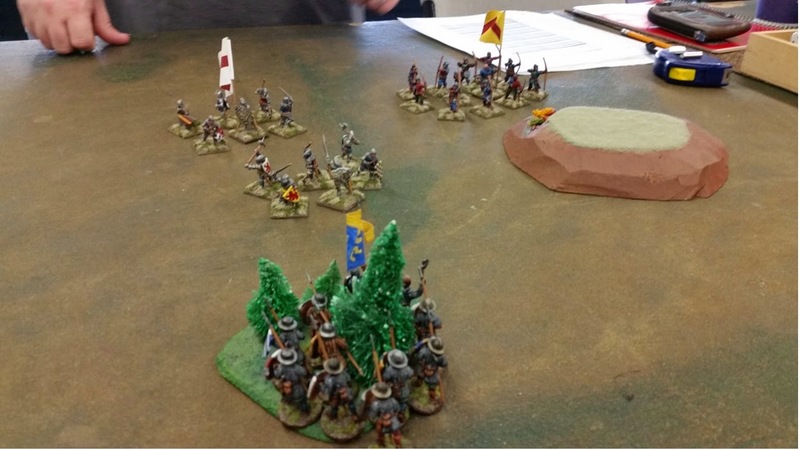 Some of the players did have issues with the 3" between units rule though. I believe they are in the spirit of the rules being kept to small unit actions. It appears that no more than two units (one per side) can be in a close combat at any given time. Although there is the possibility of a unit being attacked by two different units in a given turn - separately of course. I like the size of units and the assignment of hits to casualty per type of unit. I'm looking forward to playing out the other scenarios - as well as adding more terrain. We did use the minimum suggested - one piece per quarter. Overall I like these rules and I think they should appeal to a lot of the community for various reasons - not the least of which is the price of the rules (clearly written and nicely illustrated at that), as well as the relatively modest amount of figures required. Unless of course you want to run 4 units of Serfs! 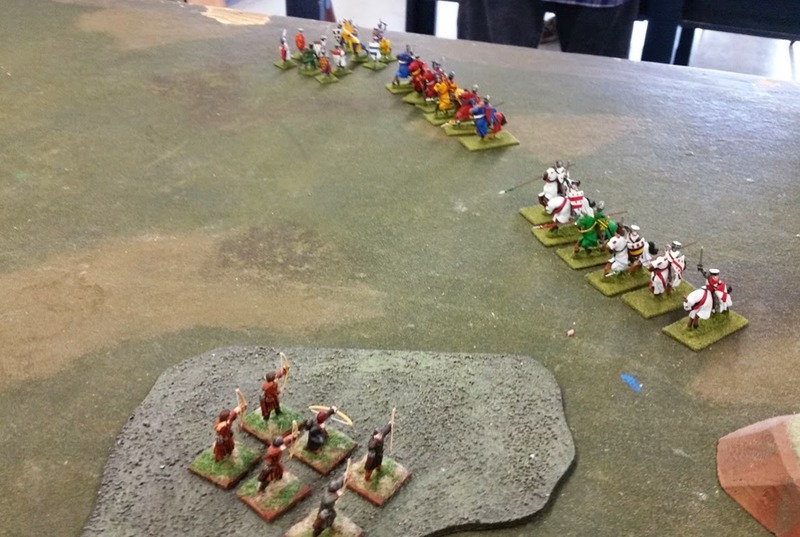 A good turn out today at the Game Matrix for some SAGA refresher training. Actually, it's been so long since I last played it, it was like learning new rules again. And to be honest, I had only played it a few times before - over two years ago. Luckily, a very experienced player showed up and provided some timely instruction. 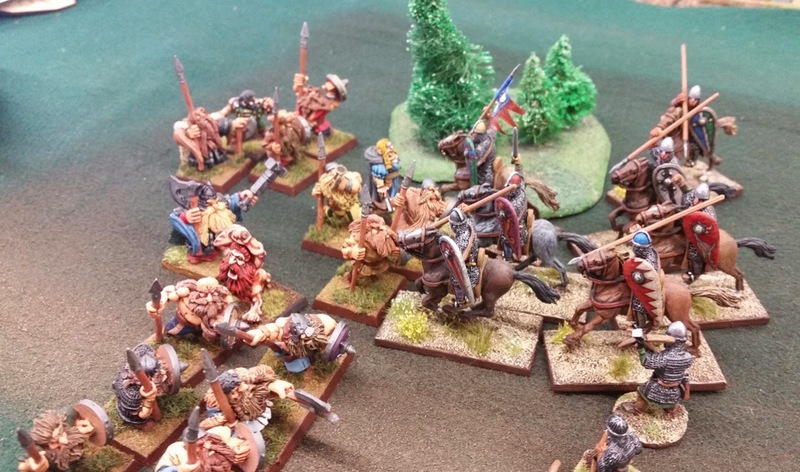 I lost both of my games against my buddy Bruce's Jomsvikings (he used Dwarfs to intimidate me even more). They kept getting full of Wrath, so it was inevitable. Plus I impetuously used my Warlord where he was killed in melee in both games. Several other players showed up too, but I was too busy to notice most of their games. 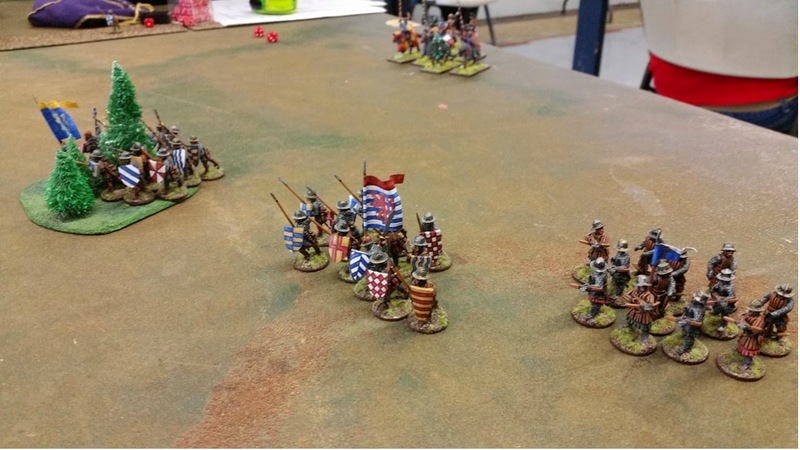 A unit of my Crusader Warriors in melee with a Jomsviking Hearthguard unit. It was quite a good session - particularly as I got two games in quicker than a single WAB game. And this with the serious learning curve going on. That all said, I'm looking forward to getting started on Lion Rampant! Just got my copy of the rules today. I've only leafed through it briefly, but I must say I am very impressed. There is a lot of eye-candy - of figures, rules schematics and artwork from Ospreys. Oh, and the $14.00 USD price cannot be beat. 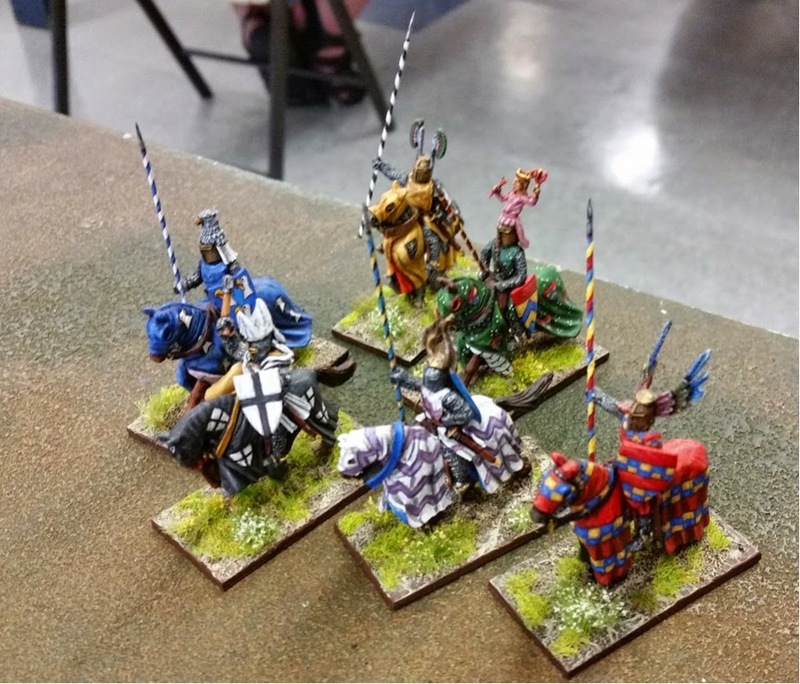 In anticipation of the rules, I cobbled together a retinue using existing figures from my Early-HRE WAB army. The retinue pictured is composed of two units of mounted men-at-arms, two units of foot serjeants, and a unit each of archers and crossbowmen. The funny thing is a bunch of us are meeting tomorrow to play SAGA. I don't think these two rules will conflict with gaming, but more likely compliment each other. 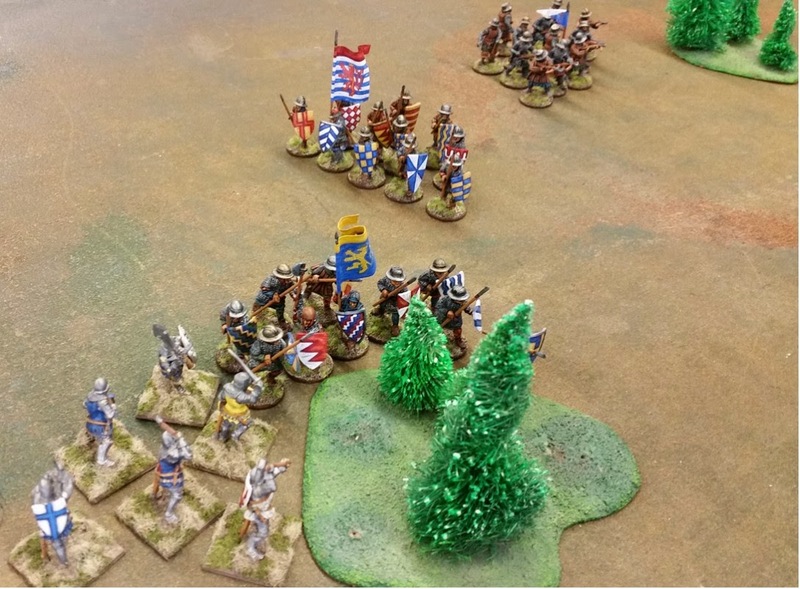 Anyway, I can't wait to get started playing Lion Rampant.